Just in case anybody has not noticed. the growing use of social media and social networking tools like Twitter and Facebook is changing the rules of who gets to break news and when. A couple of months ago, happenstance put the sports information director of a Division I basketball program in South Bend, Indiana when a major announcement was going to take place about embattled Notre Dame football coach Charlie Weis. 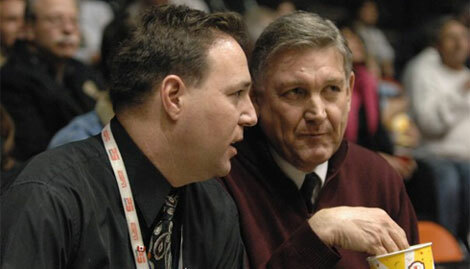 Frank "Scoop" Mercogliano, the Assistant Athletic Director for Media Relations at Idaho State University. The Idaho State Bengals were in South Bend to play a men's basketball game against the Fighting Irish of Notre Dame. As they were on an extended road trip, the team and staff arrived on campus the day before the game. Frank was enjoying the sites and sounds of the campus (and trust me, despite what you think of the Notre Dame football program, you can't help but feel the tradition and aura of the school as you walk around that campus). "It is probably not very often that a sports information director from a NCAA Division 1-AA football program, oops I mean FCS program, beats a prominent ESPN reporter with a story. After all, his job is to manage the release of information, right? Well it happened today as Idaho State University SID Frank Mercogliano reported the news on Facebook a full 10-15 minutes before ESPN's Joe Schad!" Of course, Joe Schad was at a disadvantage because he cannot be everywhere at one time as the lead college football reporter for ESPN. But this just shows an example of the limitations of mainstream media to effectively compete with knowledgeable people who just happen to be at the right place at the right time. "While the game is foremost on the minds of the Bengals, Idaho State is in the midst of watching a national media storm, with ESPN and other national media outlets having converged on South Bend to cover whether or not Charlie Weis, Notre Dame's head football coach, will be fired, despite having about $18 million left on his contract and the Fighting Irish going 6-6 this year after losing their last four." 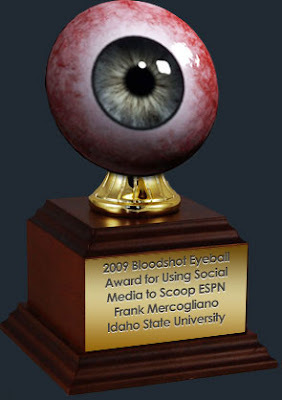 Frank's Idaho State University Bengal Blog finished as the runner-up to West Point for the 2008 "Bloodshot Eyeball" Award For Best College SID Blog. This year, he was a no-brainer pick for this 2009 recognition because as unintentional it was for him to pull this scoop off, it is a lesson that mainstream media needs to pick up on and understand: while it is very difficult for non-journalists using social media to offer the depth an analysis surrounding news news stories, it is very easy for them to beat you to the punch in breaking headlines.